“Food Sovereignty the Navajo Way: Cooking with Tall Woman” is available at Maria’s Bookshop. This well-researched book, “Food Sovereignty the Navajo Way: Cooking with Tall Woman,” published this year by University of New Mexico Press spans 55 years of work by Charlotte J. Frisbie. Frisbie, author of two previous books, is a professor emerita of anthropology from Illinois. She did her graduate work at UNM, and during her time in New Mexico had the opportunity to live with Tall Woman, known as Rose Mitchell, in the Navajo community of Chinle, Arizona. Frisbie has accomplished a massive feat with the range and scope of material included within the book. She worked with Tall Woman, gathering not only recipes but the history and culture of the Navajo. After Tall Woman’s death in 1977 at the ripe age of about 97, Frisbie completed her research with the help of Tall Woman’s daughters and other relatives. The author starts the history with the origin story from the Navajo when the people emerged from the earth. She gives insight into the religion and clan system of the people. The Navajo were hunter gatherers who roamed the Southwest. When contact was made by the Spanish in the 1500s, they were introduced to sheep, goats and horses. Around the 1600s, the Navajo began growing crops such as corn, squash and beans. Eventually, Canyon de Chelly became known as the garden spot of Navajoland. The Anglo invasion culminated in the infamous Long Walk that took place in 1863. The Navajo were forced off their land and marched to Fort Sumner, New Mexico. They were imprisoned there for five years, and it was there that the food of the Navajo was profoundly changed. Before this, their diet was very healthy, with the exception of a lack of enough vitamin C. But at the fort, their diet was forcibly changed to include processed foods like coffee, white flour and sugar. Several things were changed after the Navajo returned to Navajoland. A ration program was begun, which led the Navajo away from their normal foods, and children were sent to boarding schools where they had no access to their traditional diet. Trading posts that came to the reservation had only foods that had a long shelf life and contained preservatives. The Navajos developed a taste for sweets and sodas. Foods that used to be made from corn were now made from flour. The diet was now heavy on carbohydrates. As Frisbie writes of studies from 1997: “The researchers concluded that an increasingly sedentary lifestyle, the erosion of traditional dietary practices and patterns, and an increasing dependence on a few refined and processed foods may be major factors in the higher incidence of obesity and chronic diseases among the Navajos in the past fifty years.” Sadly, it is not just the Navajo who suffer from this effect, but they have suffered the most as a group. One in three on the Navajo reservation has diabetes. Around 1993, a grass-roots movement, now known as Food Sovereignty, began, centering around native people returning to their traditional foods. The First World Food Summit took place in Mali in 1996. Over 150 farmers worldwide are promoting family-farm-based sustainable agriculture. One only has to see our farmers markets in the Four Corners to see the effects of this movement. Frisbie has created this unique collection of recipes. They aren’t organized like a traditional Anglo cookbook. The recipes fill more than 130 pages and are detailed. Categoriesinclude: large and small wild animals; wild roots, bulbs and vegetables; berries, seeds and fruits; and breads, cakes and pancakes. This is not even close to a complete list. “Food Sovereignty the Navajo Way” is illustrated with archival black and white photos. Frisbie has helpfully included an appendix that runs almost 130 pages and includes a description of the government commodities program, fast food restaurants near Chinle, a glossary of Navajo words and terms, author notes, references and an index. The organization is clear and should answer most questions readers may have. Leslie Doran is a retired teacher, freelance writer and former New Mexican who claims Durango as her forever home. 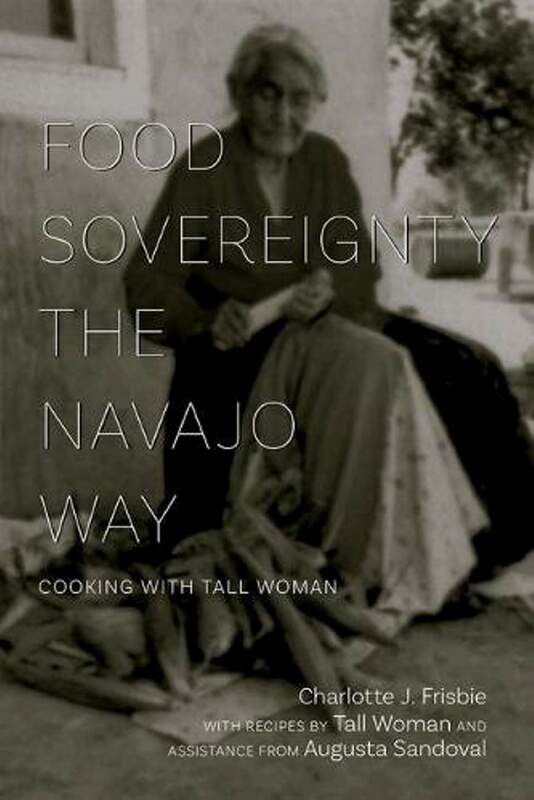 “Food Sovereignty the Navajo Way: Cooking with Tall Woman,” by Charlotte J. Frisbie, is available at Maria’s Bookshop, 960 Main Ave. For more information, visit https://bit.ly/2B35zcT or call 247-1438.